In 2012, MarineParents.com's Founder and Executive Director Tracy Della Vecchia and her son Derrick Jensen joined National Public Radio's Jacki Lyden on "Talk of the Nation" to discuss some of the challenges associated with the reintegration process. Learn more in our first article. 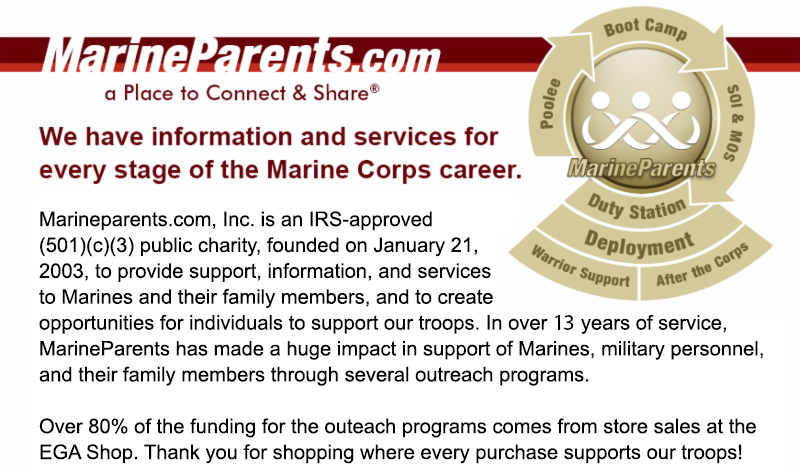 Be sure to get your FREE 2016 MarineParents' Calendar. 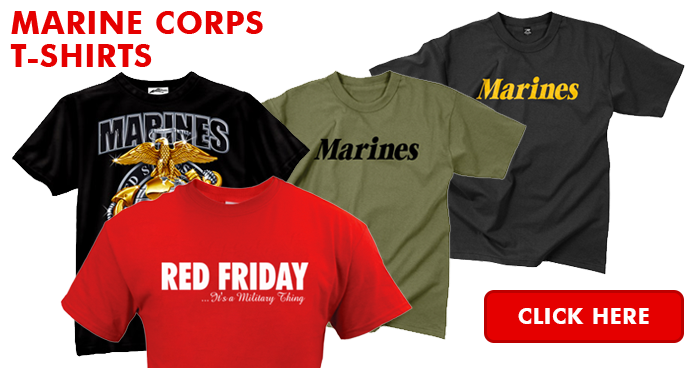 See our articles below to learn about the history of the Marine Corps, and learn about our great MarineParents volunteers. 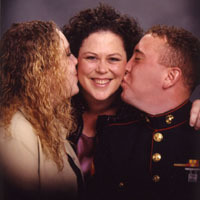 *Image info: Tracy Della Vecchia (center) with her daughter (left) and her Marine son Derrick (right). All Marines are required to go through the Individual Ready Reserve (IRR) after their initial active-service comes to an end, unless he or she chooses to reenlist. If a recruit enlists prior to the required age of enlistement, he or she would be placed in the Delayed Entry Program. Report for involuntary recall to active duty, whether operational, administrative (i.e., Administrative Musters), or legal. *Image info: Sgt. Mitchell Savage supervises and instructs Pvt. Tanner Welch and Pvt. 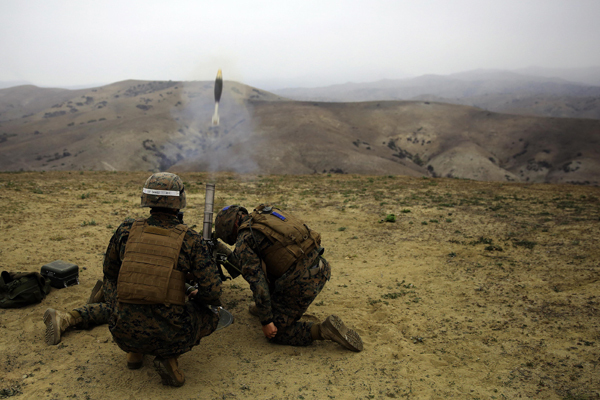 Dustin Taylor as they fire the M224 60mm Light Weight Mortar system at Camp Pendleton, California. When formal training (Boot camp, School of Infantry, and Military Occupational Specialty) is complete, each Marine is assigned to a Permanent Duty Station (PDS). 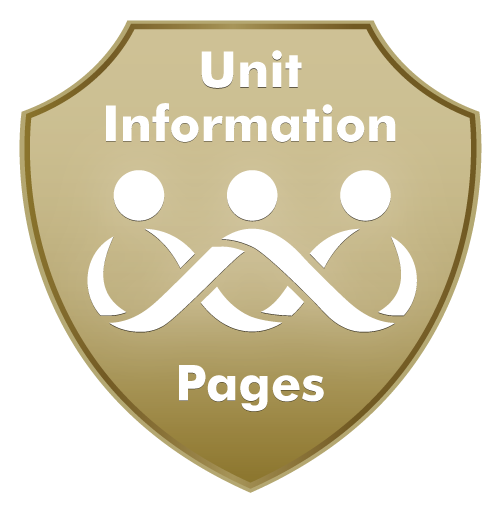 The Unit Information Pages™ (UIP™), is a searchable database exclusively from MarineParents.com, Inc. By searching the database for your Marine's PDS, you'll find a page full of helpful information, links, message boards, FRO names, and phone numbers. 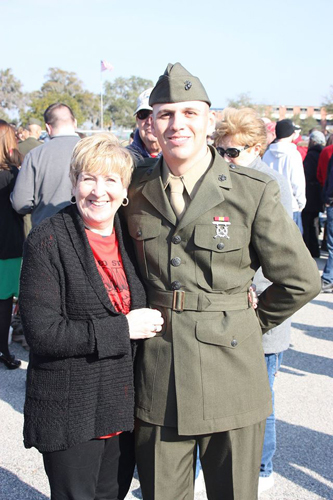 This week's featured volunteer is a proud Marine mother -- Karen Langley. Originally from Southern Virginia, Karen now lives in Pennsylvania, working as the Volunteer Services Director at the Doylestown Hospital. Karen has been a Marine Parents Facebook volunteer since March of 2015, and she currently serves as the 4th Battalion Company Leader for Parris Island. *Image info: Karen with her Marine son. Just under two weeks ago, on January 16, Marine veteran Amir Hekmati was released by the Iranian government after spending four-and-a-half years in an Iranian prison. Hekmati was arrested in 2011 while visiting relatives in Iran and accused of being a spy for the CIA. After initially receiving the death penalty, Hekmati's sentence was later reduced to 10 years. Hekmati's release came as part of an agreement between the United States and Iran and included three additional Americans that had been detained by Iran. The other prisoners were Washington Post reporter Jason Rezian, pastor Saeed Abedini, and Nosratollah Khosravi-Roodsari. Rezian and Abedini returned to America with Hekmati. Khosravi-Roodsari opted to remain in Iran following his release. 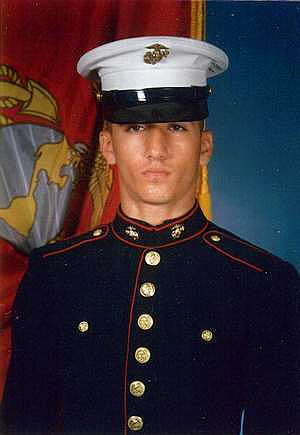 *Image info: Amir Hekmati in his Dress Blues (USMC photo). On July 16 of last year, a gunman went on a shooting spree at a military recruiting center and a U.S. Navy Reserve center in Chattanooga, Tennessee, killing five and wounding two. 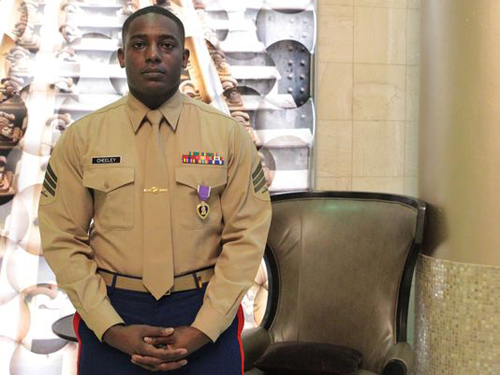 On Tuesday, January 26, Marine Sergeant DeMonte Cheeley, who was shot in the leg during the attack on the recruiting center, was awarded the Purple Heart in a ceremony in Chattanooga. *Image info: Sgt. DeMonte Cheeley stands for a photo after receiving the Purple Heart at a Jan. 26, 2016, ceremony in Chattanooga, Tennesee. (USMC photo by Cpl. Diamond Peden). Approximately two weeks ago, on January 15, Staff Sgt. 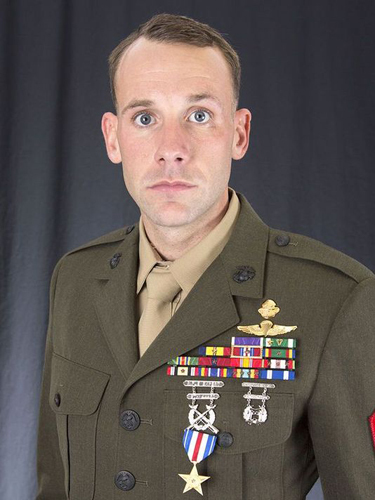 Robert Van Hook, a critical skills operator with the 2nd Marine Raider Battalion, was awarded the Silver Star for heroism during a 2013 deployment to Afghanistan. The medal, our nation's third-highest award for valor, was presented to Van Hook by Major General Joseph Osterman, commander of the Marine Corps’ Special Operation Command, during a ceremony at Camp Lejeune, North Carolina. According to his award citation, Van Hook was credited with “conspicuous gallantry and intrepidity in action against the enemy” while serving as the element leader of Marine Special Operations Team 8224 while deployed to Afghanistan's Herat province in 2013. *Image info: Staff Sgt. Robert T. Van Hook, a Marine Raider, was awarded the Silver Star for heroism during a 2013 deployment to Afghanistan. (USMC photo). the first serious ground-combat of Operation Desert Storm broke out when Iraqi troops mounted an attack into Saudi Arabia along a 40-mile front. Iraqi units centered their efforts on Khafji, a port city six miles south of the border. Saudi and Quatari troops, supported by artillery from the 1st Marine Division, attack helicopters, and other allied coalition aircraft, recaptured the town two days later. 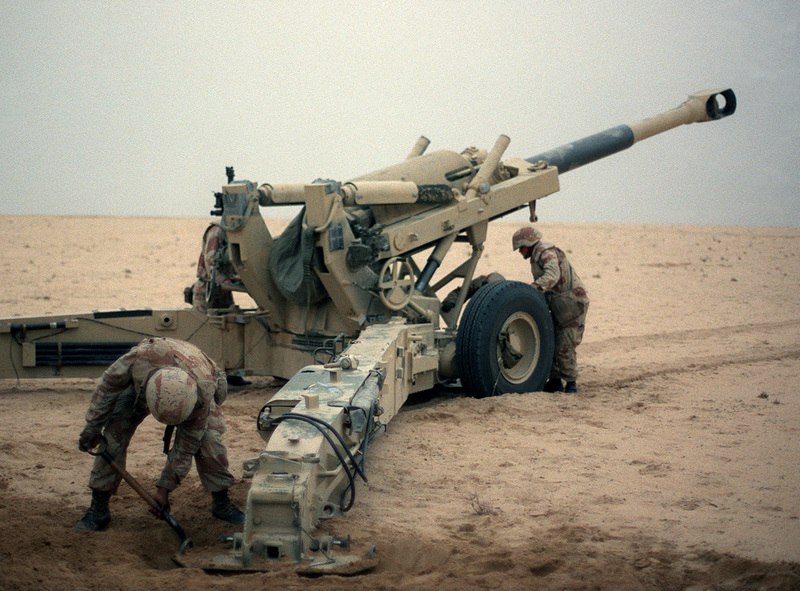 *Image info: U.S. Marine artillerymen set up their 155 mm howitzer for a fire mission against Iraqi positions on January 20, 1991 during Operation Desert Storm . American sloop Decatur went ashore at the village of Seattle, Washington, to protect settlers from raids by the local native population. 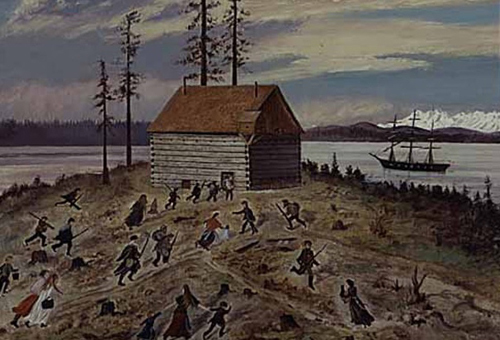 The Native Americans launched a seven-hour attack on the settlers, but were driven off later that day after suffering severe losses. Only two civilian volunteers were killed and no Marines or sailors were lost. Twenty-eight years ago this week, on January 27, 1988, approximately 400 Marines and sailors from the 2nd Marine Division, 2nd Marine Aircraft Wing, and 2nd Force Service Support Group deployed for the Persian Gulf. The Contingency Marine Air-Ground Task Force (MAGTF) CM 2-88 would relieve Contingency MAGTF 1-88 in the region and provide the effective landing force capability to Joint Task Force Middle East. 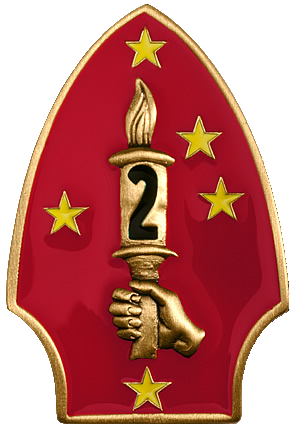 *Image info: The 2nd Marine Division insignia.